The restaurant business has the unique mix of being a product as well as service industry. The quality and quantity of food were the factors driving restaurant business for ages. However, in current scenario pricing and service offerings have jointly become core factors for business success and sustainability. Today the restaurant owner or manager has to efficiently manage all the available resources to achieve the targeted sales. Technology is the best enabler for a restaurant owner which when deployed in the right capacity and use can deliver incredible results and ease the management processes. The POS software for restaurants comes in very handy in such scenarios. The service requirements have evolved from only managing a courteous staff serving the customers in an elegant way to an era where there are food–ordering apps, delivery chains, and take-away rushes amongst a whole lot of other service-affecting aspects. Time for a customer is the most scarce resource which when optimized by the restaurateur can earn him the requisite loyalty of customers. In such a competitive era where the owner already has his hands full – if the POS restaurant software does not provide even one of the following aspects – inventory management, sales reports, payroll management, table order integration, system integration – one can infer that the POS is outdated. 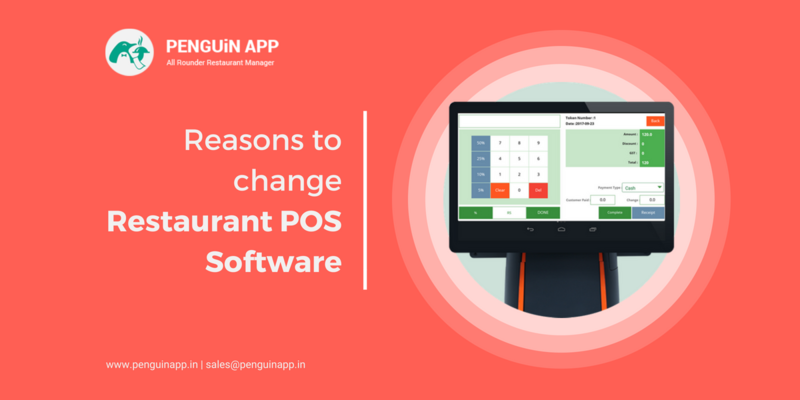 If POS needs excessive hardware support or poor UI interface or up-gradation has become a limitation, it is high time that the system has to be updated with best POS system for the restaurant. Things you should look for in a complete restaurant POS system? Sales and cost parameter integration with the ability to integrate or dissimilate information to generate meaningful information and tracking reports. The restaurant management software must provide a wholesome solution which takes care of ordering system right from steward to kitchen counters until food is delivered to the customer table. An old age POS would require steward/waiter or floor manager to take an order through an integrated app on a smartphone which gets displayed on the screen for kitchen staff – thus reducing the time and effort required to transmit the order from table to kitchen floor. Similarly, the integration has to facilitate sales and purchase information which enables more natural revenue as well as cash flow viewing and management alongside faster end-of-day transactions. The workforce management integrated with the POS systems shall enable the entire ambit of the process and procedures for the restaurateur as workforce time allocation and payroll management are an essential aspect and time-killer for the restaurateur. Customer base with its demographics: A youthful customer base would be loyal to technologically savvy ordering system whereas an elderly customer base would require some hand-holding. Items on the menu: Whether there are too many items on the menu list which need a multi-page ordering app or tab with search features or there are only a few items which can be remembered easily by staff. Floor space and number of tables: The number of tables determines the requirement of the workforce and kitchen capacity for delivering the food promptly. Accordingly, technology needs to be deployed to automate procedures. Cost of deployed labor or a better technology feature: It needs to be assessed whether implementing better technology feature or labor workforce is the better option for the current restaurant operations. Self-ordering kiosks: The young generation is the loyal customer-base of restaurants. Given a huge time shortage in all aspects, this customer-base value the time more than other classes. They don’t have enough time to wait in a long queue and wait for ordering. To handle this problem food chains globally have built kiosks in restaurants, where customers can order everything, at any time they want. Ordering through Tablet or Smartphone: One of the popular forms of automation, which has assisted customers and triggered many restaurant services, is a tab or mobile based ordering feature. This uncomplicated to access app feature helps order anything on your menu by a click on your tablet or smartphone. These amongst other relevant factors must be considered in detail and deliberated to arrive at the right combination of technology and features for the POS software. The upgrade to modernized POS software can be made in two ways – procuring available off-the-shelf software which has to be customized to the needs of the restaurant or engage a POS software developer in understanding the business needs and developing custom-fit software to deliver the necessary results for the restaurant owner. In either case, the assessment has to be precise which factors in not only the present scenario but also some future aspects of expansion at the same location or franchising which shall yield different elements. By automating your restaurant, you can increase the efficiency and functionalities of a restaurant. Technology will make processes run faster with lesser waiting time for customers which in turn enable the restaurant to build a more loyal customer base. The technology makes life easier for the restaurateur or the owner as the cash flow and workforce management can also be integrated for better reporting processes. With the right POS in place, the restaurateur will have the focus in the right zone where one can make sure to concentrate on customer and find new ways and dishes to satisfy their taste buds.